I got myself some nice cardboard, and drew a rough sketch of the motion. However, I forgot to get a semi-transparent plastic sheet so I could make a shadowless ‘sky‘ for the Transformer to rest on. This time, I was in Manual exposure mode, 1/50 seconds, F2.6, macro focus, ISO 50 and auto white balance. It took me 10 minutes to take all 45 frames. I did not do the multiple camera angles because this Transformer was so simple, it would be cooler done in one motion. 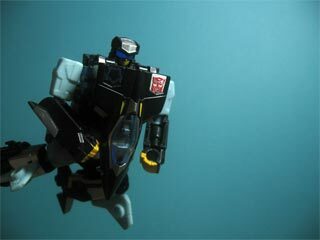 My previous, more elaborate attempt was here, with Transformers Alternators Meister. This entry was posted in Pictures, Toys on January 19, 2006 by 2konbla. The biggest challenge lies in getting the Transformer to transform without making it look like there was an earthquake going on in the background. Oh go easy on him, Will. It’s not like he didn’t try to address that problem. But it is smoother than the previous one. Woah, this is getting awesome! It looks like a reproduced scene from the cartoon series (with a lil bit brush-up of course). Much better than the previous one. Make a mini-movie after this! !